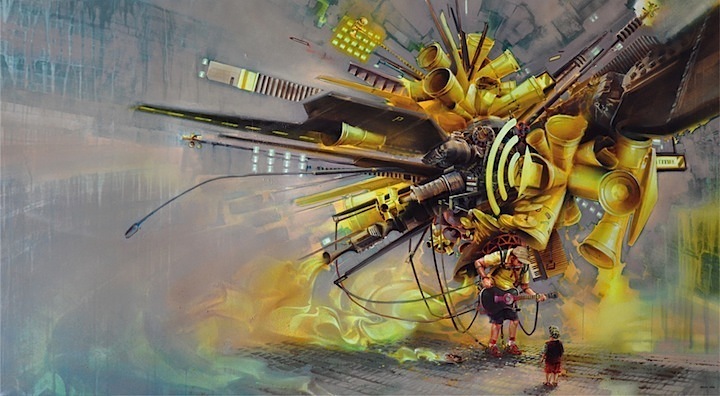 A member of schwarzmaler, a collective of outstanding graffiti writers, street artists and illustrators, Swiss artist Wes21 creates stunning, detailed works that blur the boundaries between reality and fantasy. 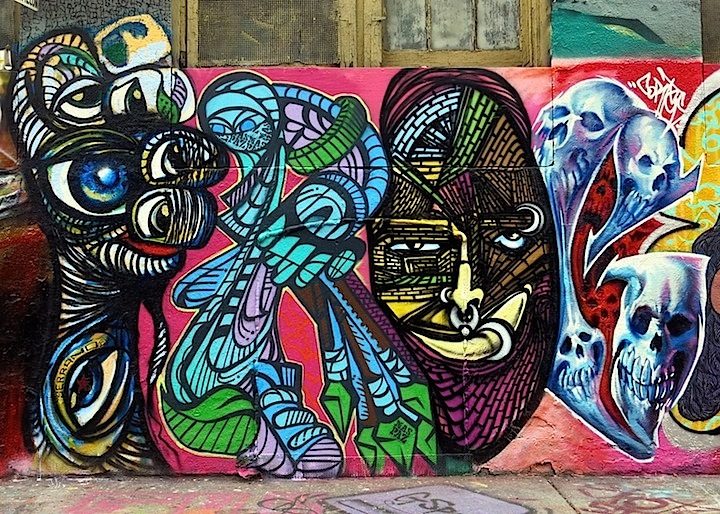 We recently spoke to him during his visit to 5Pointz. I was about 11 years old when I hit my father’s garage. In a small town near Berne. Graffiti was all around me. I grew up without a TV, and I was always drawing. So it seemed like the natural thing to do. How did your parents feel about what you were doing? They encouraged me. My father used to bring me photos of graffiti. They love it. Have you any preferred spots? I love painting anywhere but I especially love rooftops and places near water. Yes, and I do many exhibitions every year. I’ve shown my work in both group and solo shows in Switzerland, Germany, Hungary and Italy. How do you feel about the movement of graffiti and street art into galleries? I feel fine about it, so long as it’s well-done. Showing in a gallery pushes me to the next level. And then I’m a better artist when I paint in the streets! Yes. 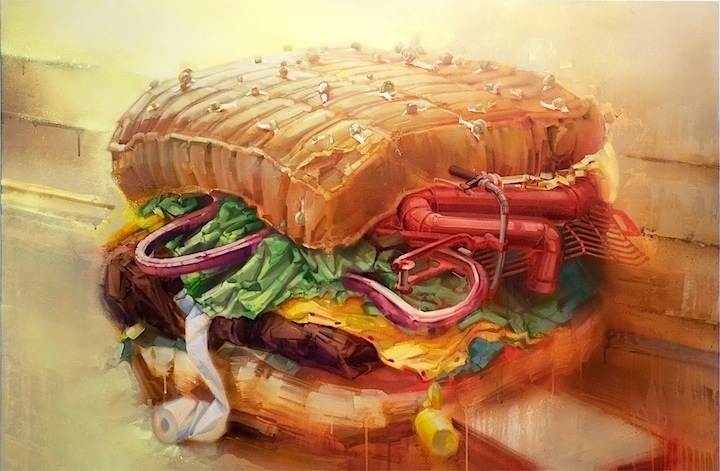 I studied graphic design and illustration in art school for four years. Any thoughts about the role of the Internet in all this? I don’t pay much attention to it. Not completely. If I were, I wouldn’t be motivated to paint another one! Not really. Most of the artists who hit the streets are open-minded. To capture a moment — real or imaginary — for eternity. 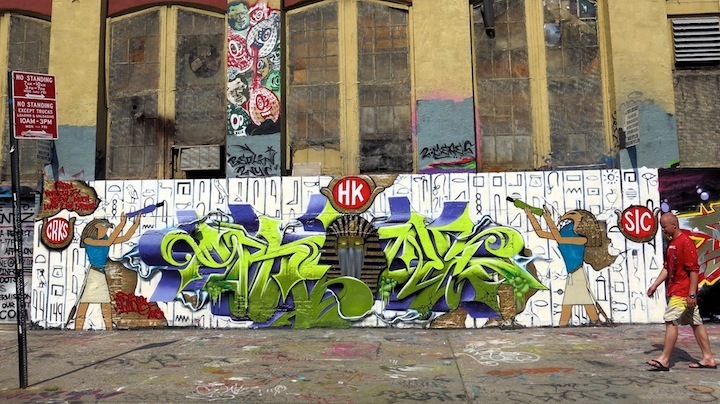 Swiss artist Kkade shared his splendid skills with us last month at 5Pointz. While he was here, we had the opportunity to find out a bit about this talented member of the Schwarzmaler Collective. When and where did you begin writing? I started writing in my hometown of Murten, Switzerland in 1999. I was 16 years old. I used to love looking at graffiti magazines and watching films on graffiti bombing. They didn’t like the police calling them. But they were always supportive. My crew members Kese 27 and Mower gave me my first, big start. And, since, I’ve done lots of writing and traveling with them. Have you any favorite writers? This is hard to answer, but crews like HA or JBCB are dope. And my favorite Swiss writers are Kesy, Irons and Toast. 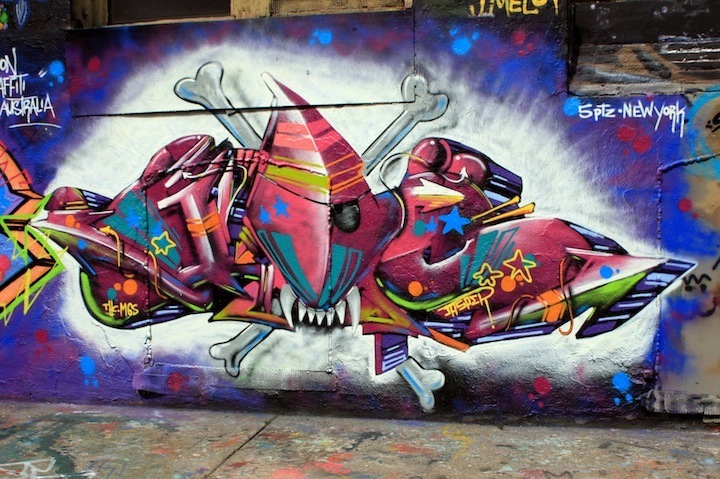 Besides 5Pointz here in NYC, where else have you painted? I’ve painted throughout Switzerland and in many European cities. Among them are: Milan, Berlin, Cologne, Amsterdam and Budapest. I have my first solo exhibit coming up on June 27 at the Trace Gallery in Zurich. And I’ve exhibited many times with the Schwarzmaler Collective. Any thoughts about street art and graffiti divide? Street art wouldn’t exist without graffiti. Graffiti started on trains and made its way onto the streets. Some people think they can do stickers and stencils and that they’re graffiti artists. But that’s not what graffiti is about. 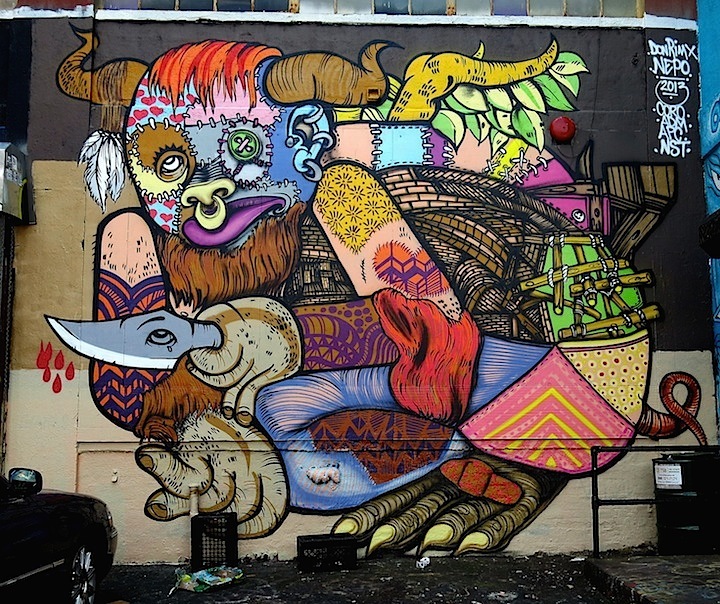 These days, street art has a bigger hype than graffiti. 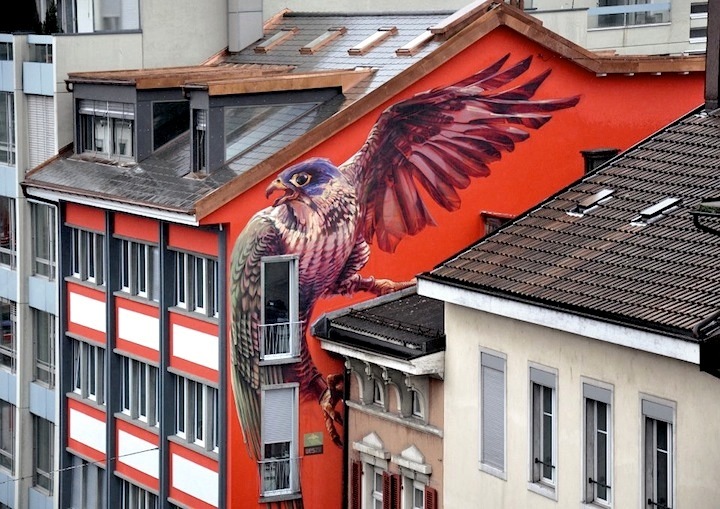 Back in Switzerland, the media recently promoted Wes 21 as a street artist – rather than as graffiti writer – when he was exhibiting his work in a gallery. It’s scene thing. But we don’t let the hype get to us. Graffiti saved my life. It kept me from doing drugs and behaving aggressively. How do you see the Internet in all of this? I think it’s really good in connecting people with the art. But it also exposes people to too much crap. And not everyone can tell the difference. Do you have any formal art education? I went to art school and got an apprenticeship in graphic design. I studied it for three years. It taught me to be more open-minded, and it did push me to do better and better. Perfecting my letters and sharing my skills with others. 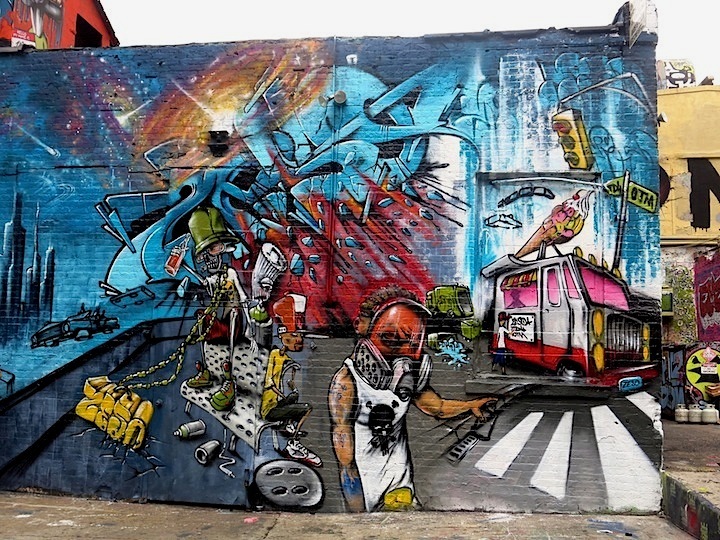 Of the many new pieces to surface at 5Pointz since it began its 11th season last month, a particular stand-out is the huge mural by Phillip Perez aka Article. Curious about the artist behind this singular graffiti aesthetic, we posed some questions to him. When did you start getting up? I first started in Houston, Texas — back in 1992. It started when my friend Big Mark aka KRAM, a B-Boy (Rock Skittles Krew) and a graffiti artist, showed me a video that featured break dancing and graffiti. Before then, I hadn’t seen anything like it. Two days after watching that video, I went bombing. I spray-painted in an alley behind my house. Any memories that stand out from those early days? A neighborhood hothead, SKEEZ 181, invited me to paint in a train yard for a graffiti battle. I don’t know how he got my number, but he did. He gave me a call one day and said he’d even pay for the paint and pick me up at my place. I was young and crazy, so I agreed. It was me and Ceroe against all of Hou-Tex freaks in a train yard in Denver Harbor. And as we were painting, a couple of train cops rolled up on Ceroe at the end of the car and start shooting at us. We all hopped about six sets of train tracks while dodging the bullets. Everyone got out of there alive. We even became good friends after. Never did like train yards, but I did it that once! Have you any preferred surfaces? No favorites. I’m a city bomber; any surface will do. The laws here don’t allow graffiti to live too long. A month maximum and bombs are buffed. So as a writer in Houston, you have to be very selective where you bomb. Location is key! What’s the riskiest thing you’ve done? I painted a wall along this railroad track with a couple of friends. Soon, the police rolled by and we were forced to hide in this ditch of muddy water amidst a horrible stench and a swarm of mosquitos. We couldn’t move or sneeze. The cops knew that there had been painting going on, as there was that strong smell of paint in the air. When the police left, we jumped out of there and ran. When we did, a police officer saw us, and hit full speed. To get away, we had to jump over barbed wire gates. We made it, but we separated as we dodged the cops. We met back up again about an hour later. Yes. When I was young, I went to jail for a lot of crazy things, but not for my graffiti art. I’d never go to jail for that. I’d feel too awful getting caught for my art. Can you tell us something about some of the other writers down in Houston? When I started out in the early 90’s, there were hardly any graffiti bombers. There were a few graffiti artists, though. 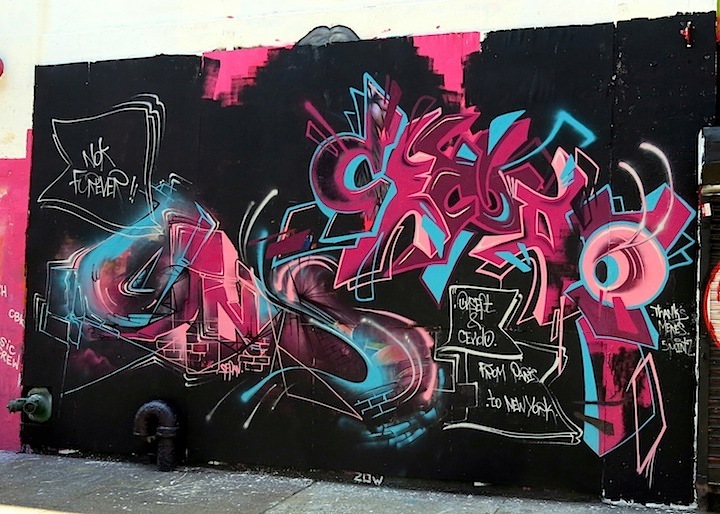 Nekst and Vizie started here in the mid ’90’s and moved on to work with MSK — from what I understand. I respect those kids. They could have done anything in life, but they chose graffiti as a lifestyle. Episode, Color One, SKEEZ 181, The One Lee, Cease, Dual — are a few cats that live the lifestyle and keep things real in the H.
Who or what inspires you these days? The lack of real graffiti nowadays is what inspires me to keep at it and teach it — when possible. This new generation needs to learn the foundation and history of this culture before they try to rub elbows with self-made artists. It’s a big let down when I meet a cat who can rock a 3-D but can’t paint regular letters or write with a nice hand style. But there are still sick artists coming out of the woodworks. Are you down with any crews? I’m in Hyroglifx Krew 182. We’re like a family here and help each other out. I don’t see it happening these days with many other crews. Internet crews have members who don’t even know each other. We were all born and raised in the North Central Houston. I have in the past few years, and I’m looking to exhibit more regularly. No. My art have been my true education. It has taught me to write proposals and contracts, research history and conduct business. Art has taught me everything. When in school, I felt like the institution was misguiding me. What’s the attitude of your family and friends towards what you do? My mom bought me my first can. She has been supportive of the graffiti art, but not of the graffiti bombing. It’s a life style and culture. For me, graffiti is a rare art form. I often find myself explaining it to friends. I never get any real negative feedback from them, though. What percentage of your time is devoted to writing? It’s a balance. I have to maintain my commercial works and still fit in my street time. My heaviest bombing years were throughout the 90’s. I’ve had to slow down in the 2000’s because of paid gigs, which took up a lot of time and energy. ,Have you a steady day job? Yup! I have an in-house art gig for a corporation. It helps me pay the bills and buy paint supplies. When I’m not working there, I do commission work for various people. Along the way, I’ve met a lot of actors, musicians and politicians who are interested in what I do. So luckily, I get to work for them and anyone else who needs art of any kind. Anything that is even vaguely art-related interests me. I’m also interested in history. How has your work evolved throughout the years? It’s evolved a ton. I taught myself foundation, structure, color schemes and balance. And through that learning process, my work naturally evolved into what it is today. How did you connect with 5Pointz? My boy Episode gave me Meres’s number and I texted him. A thousands miles later — with a hundred pounds of paint — I presented my layout to Meres, who approved the sketch and got me straight to work. Can you tell us a bit about this image? 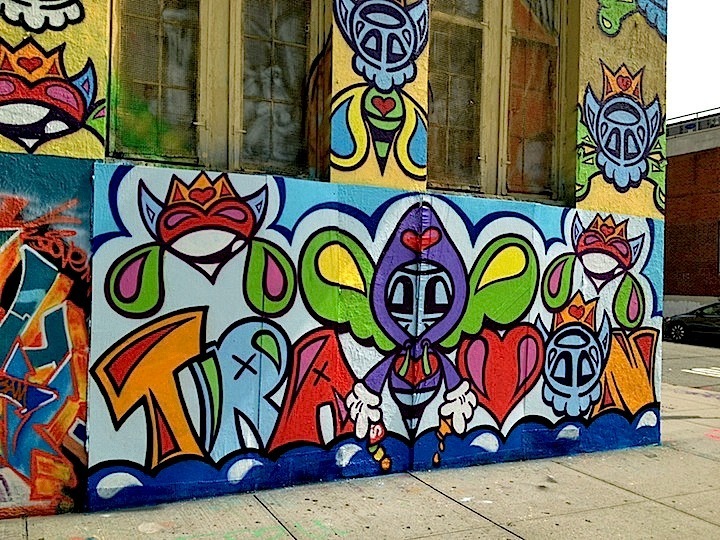 It’s a memorial wall — a tribute to the building representing the kings, the OGs of New York City graffiti. I don’t want to see the building torn down. 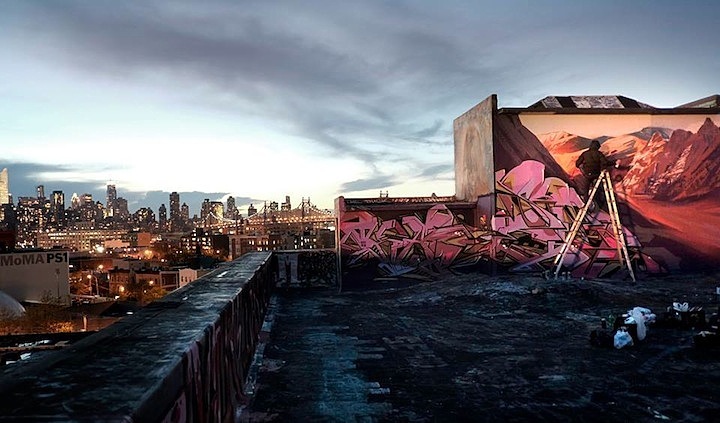 With its gold background, the piece represents the significance of 5Pointz. 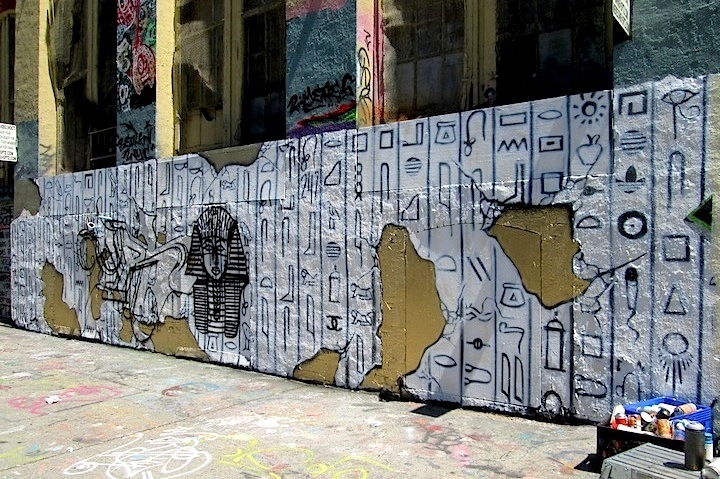 The hieroglyphics are actually names of important writers such as Stay High 149, Dondi and IZ the Wiz, to name a few. And overall, the work represents the style of my crew. 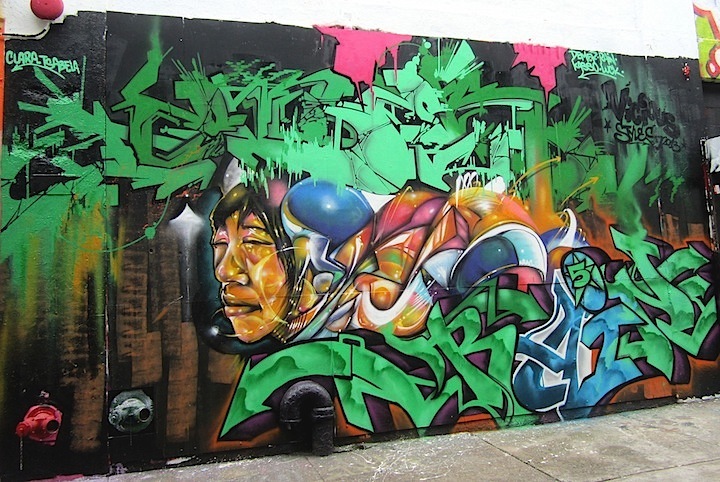 It’s an offering to the 5Pointz community and its importance in the movement. Even in Houston, we know its value.